Aah, Billy at A Table For Two has a totally nomlicious post up for Merdeka Day, Secret life of Street Food in Malaysia, go check it out to see what I'm thinking about when I say 'I love Malaysian kuih.' You have to scroll past the meaty bits, but oh it is worth it for the kuih, it is. Maybe there will be another post later with sweets for Merdeka Day (I bought a whole bunch of bananas in preparation), but for now I want to talk about char kueh teow. Don't be fooled by those recipes which might say to use lots of greens, lots of veggies. This is a very simple dish, the flavours are very straight forward and come mostly from the soy sauce and the chili, the beauty of this hawker favourite is in the kueh teow noodles, so there is no need to overwhelm with lots of veggies. A packet of noodles, some chilis, some bean shoots, a little tofu, this is all that is necessary. And a banana leaf, if you've got one, on which to plate it. You can add some carrot (julienned), or a little bit of gailan (not 'and'), but don't go over the top. Things about cooking char kueh teow: you need a wok, and the wok needs to be very hot. you will burn some of the noodles to the wok, and this is part of the process. do not double this recipe - if you go for much more noodles than this, it doesn't really work. Better instead to cook two lots of these portions. Gently separate the noodles, and soak in warm water for three or four minutes, then drain. Don't oversoak them, or they'll fall apart when cooking. In a hot wok, add a tablespoon or two of oil (preferably peanut), then the garlic and chilli. Add the carrot at this time if you're adding it. Fry for a minute, then add the noodles, as well as the dark and light soy. Toss the sauce and the pepper through the noodles. Leave to fry for a few minutes, flipping as necessary. 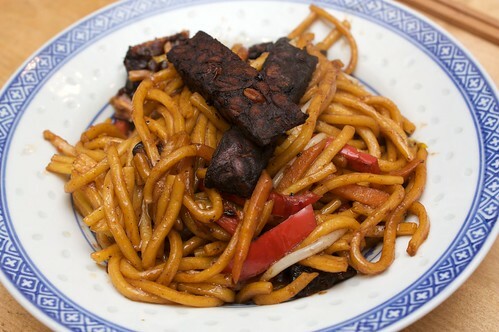 Make sure the soy sauce has been evenly mixed through - there should be no white noodles left. Crush the tofu and, having pushed the noodles to one side, add the tofu, then toss through. Fry for a few more minutes. During this time, the noodles will start to stick to the wok - unless they're burning, resist the temptation to add more liquid. Char kueh teow is very dry, and the charring is part of its deliciousness. Finally, add the spring onion (chopped) and the bean shoots, and fold the noodles over the top. Remove from heat and serve immediately. I am submitting this for the It's a Vegan World: Malaysia event. I met up with A for lunch today, and as she is gluten-free and I have no idea where to eat in the middle of Melbourne, I brought along the Melbourne Veg Guide for its first outing. On the tram I set my heart upon Nudel Bar, so we wandered up Bourke St. We were both happy with our meals. 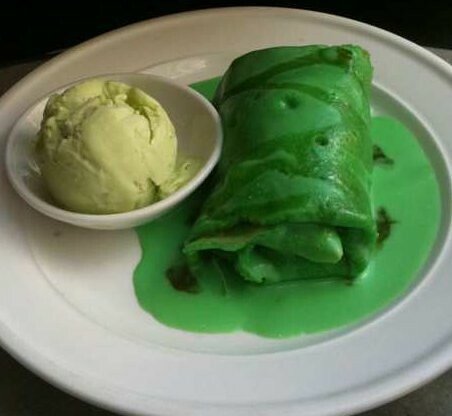 I didn't bring my camera so I wasn't going to bother blogging it, until we got to dessert and our (very delightful) waiter informed me that the nyonya pandan pancake was vegan. I have to tell you, without delay or hesitation, internets, I love pandan. When I smell pandan, I cannot help but think of Penang. When I taste pandan, I think of Penang. And to be able to eat this amazing pandan nyonya treat, with slivers of coconut through the centre! It was amazing. I was so freaking excited. Given lunch had been a very excellent char kueh teow, just the right amount of wok hei and not too many vegetables, well. It wasn't enough to make up for not being in Penang (as my mother has been this week), but it certainly helped. This photo was provided by A's camera phone. Yesterday afternoon was pretty mediocre, and by the time I finally got home I was grumpy, exhausted, hungry and cold. At times like those, comfort food is the only real answer, and I knew exactly what sort of comfort food was required. 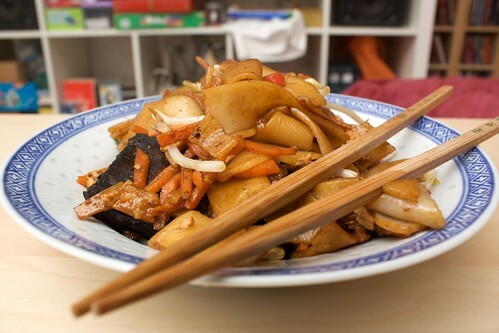 Kuey teow (or kueh teow) is a flat rice noodle that is ubiquitous in Malaysia. You might be familiar with it from Malaysian restaurants, where it is more commonly served as one of my very favourite foods, char kuey teow (which, incidentally, I cooked for lunch today and will blog about soon). Although it is a rice noodle, kuey teow noodles are not suitable for people avoiding gluten, as they are softened by the addition of wheat. It's not a dry noodle, and it doesn't freeze at all well - the only solution is to buy it fresh, as needed. It will last a couple of weeks, though. Kuey teow noodles really soak in the flavour of a dish. They need to be softened first, either with a minute or two on the stove in some water, or soaking in hot water for five or six minutes. Once they are prepared, though, they make a quick and easy food, so they are very popular noodles at hawker stalls. I prepared this noodle soup the hawker way (except the carrots), no more than blanching the ingredients, keeping them crisp and delicious. A full-flavoured homemade stock is best. If you don't have the time, bring the stock to a simmer, and add the base of the bok choy and the top of the carrot (ie, the bits you usually throw out) into the pot, and simmer for about half an hour. If you do this, you will need extra stock, but it is worth it for the flavour. Bring the stock to a boil, add the lemongrass and garlic, and reduce to a simmer, lid off. After ten minutes, add the carrot, and continue simmering for another ten minutes, then add the bok choy stalks. In the meantime, soak the kuey teow noodles in hot water, and then drain and separate. 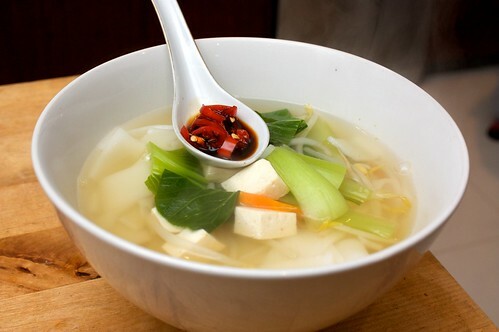 In a small bowl, mix the chillis with a little bit of dark soy sauce, but a few shakes of light soy sauce. Set aside. After two or three minutes, the bok choy will have just started to soften. Add the kuey teow, bok choy leaves, and bean shoots. Stir through, and remove from heat. Serve, and mix through a spoon or two of the chilli-soy sauce mix. I am probably going to submit this to the It's a Vegan World: Malaysian blogging event, but I have one thing planned that I definitely want to share for that (PISANG GORENG) so I might not. We shall see! I always feel a bit awkward when I submit too many things for blog events. These were whipped up by SJ one night after dinner, whilst we were still staying with them. We were just sitting around, watching something and chatting, and suddenly this pastry appeared before me! 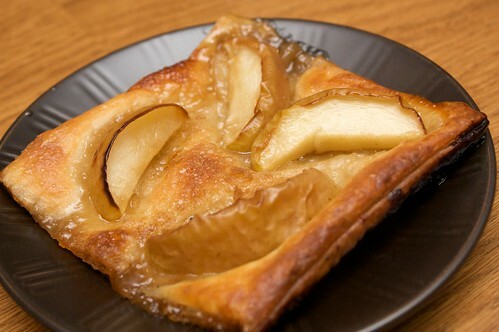 Apple and puff pastry, what a delightful combination! One of the awesome things about staying with friends is getting to use their kitchen to cook, instead of having to rely on constant takeout. One night it was just D and I pottering around, so I nipped out and picked up some spinach, mushrooms and tomatoes, for a quick and rich pesto pasta. I'm totally in love with pesto pastas at the moment. Put the pasta on to cook. Take a handful of spinach leaves (no stalk), and pound (or blend), gradually adding the pinenuts, garlic, and olive oil, as well as more spinach (about a quarter to a half of the bushel), until a rich, goopy texture is achieved. Slice the mushrooms, and saute in some olive oil. When they are soft and have released a lot of liquid, throw in the tomatoes (halved), and some more of the spinach. Stir for a minute or three, until the spinach has wilted and the tomatoes are looking a little bit wrinkly, but don't overcook them! 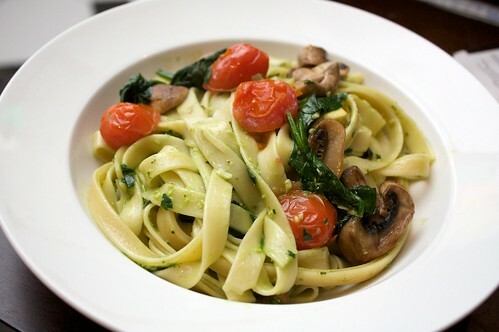 Drain the pasta, and combine with the pesto, and stir through the mushrooms, spinach and tomatoes. Serve hot. This post is not about food! Well, in a round about way it is, but not really. One of the reasons why I became a dedicated and passionate eater of no meat was because of my work in and concern about sustainability and climate change. I can link to figures and facts if you like (just ask),* but I'm sure most people reading this blog already know them, or know of them. The contribution of the meat production process to climate change is so significant, in its disproportionate water use, energy use and land use, that it's just so important to consider in personal change. Anyway, there's this movie that just came out in Australia yesterday. It was filmed on the tiniest budget, the crew earned literally survival wages, and they've no budget for advertising or anything. I thought it was only screening for two days, but it appears to be screening for a week in some places (certainly in Carousel and Garden City in Perth it's screening until next week), so I'd like to take this opportunity to briefly pimp it here. The Age of Stupid is a movie/documentary/post-apocalyptic thing featuring Pete Postlethwaite as an old man living in the devastated world of 2055, looking back on documentary footage of 2008 and wondering why we didn't stop climate change when we had a chance. It touches on less meat for about half a second, and is more focused on bigger things, community groups and corporations, but I still think it is worth the watch. I've been feeling complacent, lately, in my little bubble. I mean, sustainability and climate change is what I do. So I'm doing enough, right? But this was a well-timed push up the bum, just as I'm about to start a new job. The trailer can be watched on youtube. Go see it! After Australia I understand it will be moving on to other countries, so you can see it even if you're not in Australia. Or, if you have seen it, let me know what you thought! Claypot is an essential Malaysian cooking style. Cooking in the claypot gives your dish an interesting extra flavour, and it means you can transfer straight from the stove to the oven without a dish transfer, which helps retain all of those awesome flavours. Claypot is quite common at the hawker stalls, and it is awesome. My favourite claypot dish is claypot noodles, but yesterday I thought I'd try a veganised version of an old favourite, claypot chicken rice, combining two of my hometown favourites (chicken rice, and claypot) into the one dish. For this I made a claypot tofu rice. This used the rich flavours of claypot cooking, in conjunction with the simple ginger and soy freshness of the usual chicken rice recipe. Claypot rice is often garnished with spring onions, but I use them so rarely it seemed a waste to buy an entire bushel just for this one dish. 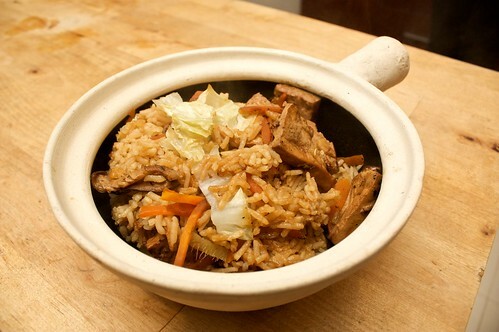 If you don't have a claypot, you can use a pot with a tight lid, or a rice cooker. Combine one tablespoon of dark soy, one tablespoon of light soy, and two tablespoons of oyster sauce, with half a teaspoon of castor sugar, a shake of ground pepper, and a quarter of a tablespoon of powdered stock. Into this marinade add about a centimetre of ginger, crushed. Combine well, until things which are powdered have dissolved. Slice up the tofu into chunks of about ten cm in length, and cover in marinade. Allow to marinate for half an hour to an hour. Soak the mushrooms in hot water for twenty minutes. After the mushrooms have soaked, it is time to prepare the rice! Rinse the rice. Then add two cups of water, plus a teaspoon of dark soy, a teaspoon of light soy, a shake of pepper, and a shake of sesame oil. Julienne some ginger finely, and add this as well. Start to cook, lid on. In the meantime, lightly fry the tofu in a little peanut oil. Be sure to fry both sides. Drain the mushrooms, and add this, then add the carrots for another half a minute. The carrot won't be cooked, but that's okay at this point. After the rice has been cooking for about seven or eight minutes, it should have just started looking 'dry.' Throw the tofu, mushrooms, carrots, and cabbage on the top, then put the lid back on and keep cooking for another fifteen minutes. After the rice is cooked right through, leave to sit, still with the lid on, for another twenty minutes. This will give the flavours a chance to seep in. 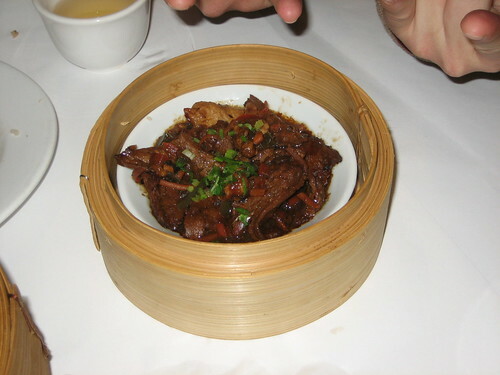 Serve in the claypot, if you've prepared it that way, or in bowls. First blog from the new kitchen! This isn't the first meal I've cooked since we arrived in Melbourne (I cooked a few times at SJ and Essie's house); nor is this the first meal I've cooked in this kitchen (there were some burgers, and some dahl and roti last week); but here we are at the first blog post from the new kitchen, and I'm a little bit excited. Thanks to everyone who advised me on where I might buy some supplies. My big successes were the Indo grocery at Barkly Square, Minh Phat at the markets, and Richmond Asian Grocery on Victoria Street in Richmond (about 200ish), which had a huge freezer filled with vegan bao and other goodies, and the most giant yao chao guai ever (which I've not yet cooked, though it is in my fridge). Seriously, it was like 40, maybe 50 cm long. Anyway. Five spice is such a great flavour, it instantly makes anything delicious and is just awesome. I find the best combination is to pair it with a little dark and a little light soy, it really complements the flavour. Dissolve the five-spice into the dark soy and one tablespoon of light soy. Slice up the tempeh into fingers, about 10cm in length. In a container with a lid, marinate the tempeh in the five spice and soy. Make sure the lid is on tight, because after a while you will flip the container over (to ensure it's well marinated). Marinate for at least an hour in the fridge - I like to leave it for a couple of hours. In a wok, pour some peanut oil, at least three or four tablespoons. When it is hot and ready to go, start placing the tempeh into the oil, three or four fingers at a time. After a minute or so, flip, so both sides are cooked. Then after a minute on that side, move the tempeh to the side of the wok, still near the flame but out of the oil. Put in the next lot of tempeh. This bit can get a bit complicated, you have to keep an eye on the tempeh in the oil, and also flip the tempeh on the side of the wok. As you move the next lot up, you can put that tempeh from the sides onto a baking tray. Repeat process until all is finished. Bake tempeh at about 180C for about 15 minutes, flipping halfway. Take the container in which you were marinating the tempeh. Add two or three tablespoons of hot stock, and half a teaspoon of dried chilli flakes, to the left over marinade. Julienne the carrot and capsicum. Cut up the cabbage into finger sized strips. Soak the mushrooms in hot water. Remove any excess oil from the wok, conserving about a teaspoon in the wok. Start up the heat again on high, and through in ginger and garlic. Stir-fry for a few minutes, then add carrot and capsicum. Toss and fry, then add a spoon or two of water and put on the lid. Leave to steam for a few minutes, tossing occasionally, until soft. Add the cabbage about midway. Rinse the noodles. Toss the noodles, mushrooms and beanshoots into the wok, as well as the light soy, the sesame oil, and the left over five-spice marinade mixture. You can also add some of the mushroom liquid, if you like slightly damp noodles. Put lid on, and leave for a minute or two. Then toss four or five of the tempeh fingers into the wok, breaking them into smaller pieces as you toss. 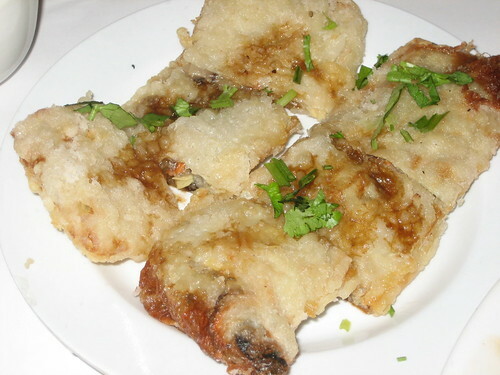 Serve, garnished with two or three slices of tempeh. So we're living in an awesome place in Brunswick, just off Sydney Road (just up from Tabet's Bakery, with its allegedly delicious vegan baked goods). Before we left Perth, I was using up a lot of our dried goods, and then I gave away anything that might make a mess in transit (soy sauce, oils, coconut milk). As a result, I now can't find anything! Rice - I use either Elephant or Sunboat, identified by the corresponding symbols on their white bags. I buy these in anything over 10kg bags. If anyone can tell me where I can find these, preferably as close to me as possible, I would be very very grateful. Also if anyone has a lemongrass plant they're willing to divide for me, that would be awesome. One of the last things I made before we left Perth was a mushroom and spinach lasagna with a tofu bechamel sauce. I wasn't sure how it was going to turn out, but I really liked it. I used a sundried tomato pesto for this, because I had sundried tomatoes on hand, and I like the stronger taste. A basil pesto would also work. In a lot of olive oil, heat some marjoram and oregano. Dice the onion, and fry in olive oil over low heat for eight or nine minutes, until they are quite soft. Dice two cloves of the garlic, and add to heat, fry for a few more minutes. Add the tomato (diced) and all the juice, fry on high for a few minutes then reduce and simmer, covered, for twenty minutes, or until the tomatoes have reduced to a mushy sauce. In the meantime, slice and fry the mushrooms in olive oil or a vegan margarine. Set aside. Pound together the sundried tomatoes, pine nuts, and remaining garlic, and drizzle olive oil through as required. As an alternative, the oil in which the sundried tomatoes sat could be used. In a blender, mix together soy milk, nutritional yeast, chili flakes, and tofu, and some pepper if required. In a square dish, about 25 x 25 cm, spread a thin layer of tomato mixture. Cover with lasagna sheets, then cover lasagna sheets with half of the pesto. Place mushrooms onto this layer. 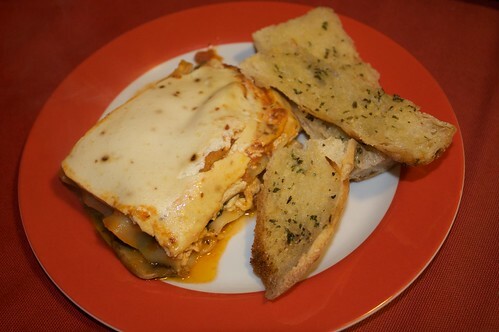 Drizzle with some of the tomato sauce mixture, then cover with lasagna sheets. Repeat with pesto, spinach, tomato sauce and final lasagna sheets. Spread across remaining tomato mixture, and cover completely with tofu sauce. Bake in oven at 200C for about 40 minutes, or until lasagna sheets are easy to slice through. D was recently in Cambridge, and although there was a complete failure of photo-taking, there was one or two. Giraffe is a chain of cafes throughout the UK, and a popular eating place for D's Cambridge colleagues (as demonstrated by the number of juice giraffes on their desks). The menu is immediately vegetarian-friendly, but is not immediately vegan-friendly (and the waitress didn't know what vegan was). 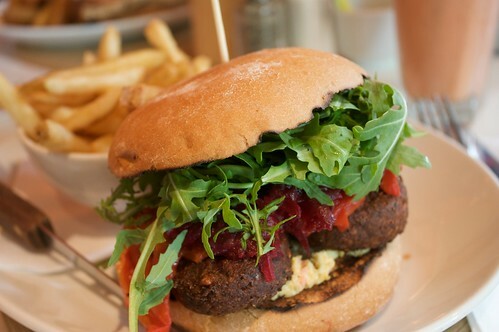 But they were happy to remove things from the felafal burger until it was vegan (and delicious). Will had a vegetarian breakfast which comes with veggie sausages. 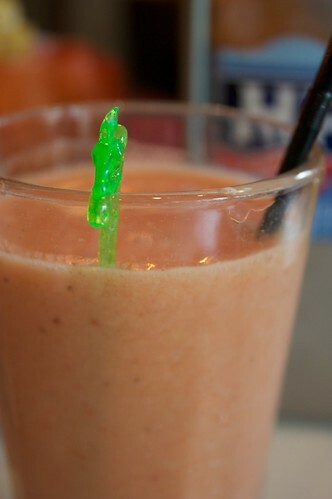 The juices are really tasty and come with a giraffe looking over the glass. The prices were expensive by Australian standards (£10-11) but maybe not by UK standards? Not sure. Ventured out to Box Hill this morning with (part of) my Melbourne posse for a belated birthday excursion. In reality, this was just an excuse for me to finally visit the much talked of Vegie Hut Sunday morning yum cha. This has previously been talked about by Cindy here and by Lisa here. We started with some congee, which was one free bowl for every two items from the dim sum menu. 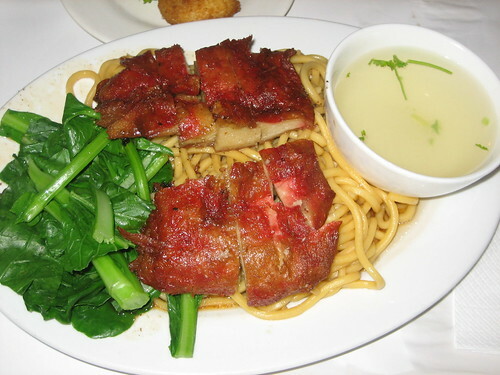 Next was a roast duck noodle, which was very good, the soup was delicious and the duck was quite tasty. 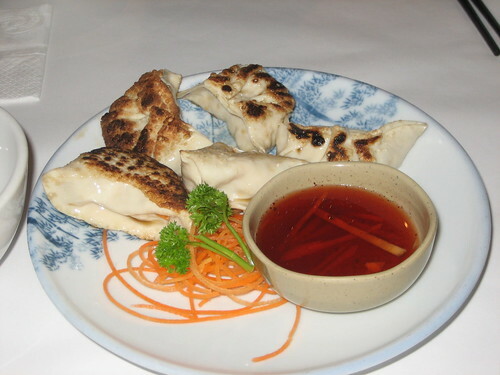 The grilled dumplings were delicious, and as always so much better than steamed dumplings. The filling in these ones were especially tasty. We ordered some pumpkin cakes, which I didn't end up trying, and some ribs in black bean sauce, which I also didn't try. Some people didn't like it, but happily SJ took one for the team and devoured them. The siu mai (sadly no photo, it was very blurry) was excellent, so we shortly ordered a second serve. We ordered some crispy noodles (originally destined to be flat rice noodles, sadly no longer served) and some fried rice (for Es, who apparently loves it). The noodles were really tasty, and the fried rice was okay. Next was the crispy tofu skin (delicious!) and the prawn cake (disturbing but delicious). 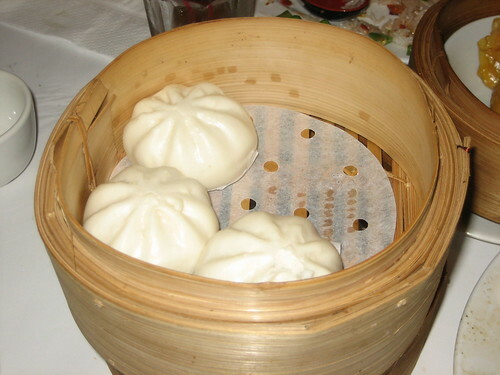 We rounded that out with some char siu bao, two delicious serves of om nom noms. We sat around nursing our stomachs, and I declared that I was nowhere near full enough, so to go with the second serve of siu mai we ordered some choi sum in ginger, and some soy nuggets in pepper sauce from the lunch menu. The choi sum was excellent, it is my favourite way to serve it, and a great way to end a meal. The soy nuggets were okay, and the pepper sauce was very peppery, so if you are into pepper sauce that is definitely the dish to pick. Things we didn't try that I wish we had: spinach dumplings. Things they didn't have that I really wanted, so if they're available anywhere else in Melbourne please tell me: chee cheong fun, four seasons buns.